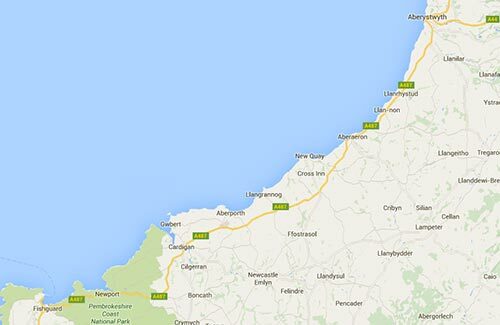 Cardigan Bay offers visitors stunning beaches and a wealth of fascinating marine life. Dotted throughout the lush, green farmland are seaside towns – some cosy, some colourful – all offering a unique flavour of this historically-rich part of Wales with high quality restaurants, pubs and places to visit. On your short break you will be able to choose from gentle walks and picnics, with panoramic views that haven’t changed since the Middle Ages, to thrill seeking sports, made possible by the dramatic coastline, numerous rivers and glacier-cut gorges that feature in the area. Search for the petrified forest on the beach at Borth, visit the historic centres of Cardigan or Aberystwyth or spot dolphins, porpoises, seals and the occasional Orca. You can also seek out a remote gem of an eatery and take in some of the most spectacular sunsets in the UK. Whether you stay for a few days,a week or longer you will be sure to discover lots of exciting activities and sights to see in the West Wales gem that is Cardigan Bay. If you book your UK short break in Cardigan Bay with Cool Coastal Lets, we will ensure you are provided with premium customer service and holiday lettings. We will always be on hand to offer local advice and make your stay as magical as possible. Based in New Quay, Cardigan Bay Water Sports offers taster sessions in sailing, kayaking, windsurfing and paddleboarding. You can also hire paddleboards, kayaks, sailing dinghies and windsurf boards from the centre. The Cardigan Bay Marine Wildlife Centre (CBMWC), which focuses on marine research in the area, is a non-profit organisation that is dedicated to conserving Cardigan Bay’s marine wildlife through education and research. There is a visitor centre, located on New Quay sea front, which works in conjunction with Dolphin Survey Boat Trips to collect data on the bottlenose dolphins of Cardigan Bay and the other marine mammals that are regularly spotted, such as harbour porpoise, Atlantic grey seals and more unusual species like basking sharks and sunfish..
SeaMôr Boat Trips offers Cardigan Bay tours from both New Quay and Aberareon. You can book dolphin and wildlife watching boat trips which head down the beautiful Ceredigion Heritage coastline into the well known dolphin feeding areas of Llanina Reef and New Quay Bay. The marine biologist guides and knowledgeable skippers will also teach you about the local history, geology and abundant wildlife that Cardigan Bay has to offer. Husband and wife team, Corrine and Tim Harrison, run this friendly and fun-filled sea fishing trip and tour company; Bass Fishing Trips, Sea Bass Safaris, Crab Fishing Trips and the wonderful 3 Fishes are all owned by the business. The trips are great for families and children and easy to use fishing equipment is provided free. Beginners and novices are well looked after and the best part is that you can take your catch home. Based in Aberaeron, The Harbourmaster restaurant and bar serves the best of local produce at breakfast, lunch and dinner times. Set in a refurbished harbourmaster's house dating back to the early 1800s, this quayside restaurant is a 1-minute walk from the beach. The Hive bar on Aberaeron quay is open throughout the day from 10am until late in the evening. You can sip cocktails whilst relaxing in the conservatory or enjoy the burgers, steak, fish and shellfish offered at The Hive Grill. The Hive is also the home of the famous Honey Ice Cream, which is made on the premises. A yummy variety of flavours is offered; from the traditional honey vanilla and chocolate to the more exotic Honey Turkish Delight. For the more health conscious, there is also a range of tasty sorbets and yogurt ices. Previously the Hungry Trout, more information to follow after their relocation to Church Street. The Ship Inn, which offers locally-sourced food, is a friendly and welcoming place only a stone’s throw from Tresaith beach. You can relax with a drink either inside the pub or on the heated terrace with a chance to spot the dolphins! This summery cafe overlooks Llangrannog bay and serves coffee, cakes, fish & chips and Welsh specialities. Aberaeron has two beaches - one on either side of the harbour. The south beach has coarse sand at low tide and is backed by a bank of mostly boulder clay pebbles. The north beach is mostly rocks with very little sand. A dog ban operates on the south beach between the first groyne to south of Beach Parade and the Harbour Walls, from 1st May to 30th September. Away from Aberaeron the shore becomes rockier in both directions. Surf conditions can be good and usually best at low to mid-tide, but it can get crowded here. There is P&D parking overlooking both beaches with plenty of free parking in the town on the north side of the harbour. New Quay has two main beaches - Dolau beach (west of the harbour) and Harbour beach. Harbour beach is mostly sand and is patrolled by lifeguards from the end of June until early September. A dog ban operates May to September inclusive. A swimming zone is usually set up, but at some stages of the tide boats have to cross this to reach the moorings in the harbour. For Harbour beach weather and tides see here. Dolau beach is north of the harbour and is approximately 120 yards wide at low tide. It is mostly coarse sand and broken shells and is backed by a seating area. Surfing, swimming, windsurfing and kayaking are popular activities and dogs are allowed at all times. Facilities include toilets with disabled facilities, numerous food outlets, public houses, beach shops, drinking water, a seasonal Tourist Information Centre and cycle parking. Bottlenose dolphins are often seen in Cardigan Bay and dolphin watching boat trips run from the harbour. New Quay is a very popular UK short break location and for good reason with its beautiful beaches, breathtaking wildlife and boutique restaurants. Seal pups are born here in the autumn. The beach is closed to the public at this time but you can view the seals from the car park. The beach is widely believed to have been used for smuggling, while views over the cove can be gained by walking up the side of the restored lime kiln. At low tide it is possible to walk from the main beach at Llangrannog to the second beach, although a cliff path starting up the steps next to the Quay Café makes the second beach accessible at any time. Plan ahead by checking tide times here. A circular walk can be followed around the headland of Ynys Lochtyn which boasts Cardigan Bay’s tallest cliffs. The Ceredigion Coast Path enters Llangrannog from Penbryn by dropping down onto the beach. Dogs are prohibited from the beach area between Nant Hawen and Pen Rhip between the 1st May and 30th September inclusive. Tresaith beach is set in a small, sheltered, sandy bay named after the River Saith, which cascades as a waterfall over the Cardigan Bay cliffs to the beach. The beach is very popular with families during the summer offering safe swimming and rock pools. A second beach is accessed by crossing below the waterfall - take care to watch the tides. There are public toilets near the beach with wheelchair access. There is also a café, a first aid post, a shop and The Ship Inn pub providing lots of tables inside and out for meals overlooking the beach. The beach has a slipway and is a popular sailing destination. There is limited car parking at the beach itself, but there is a large car park at the top of the hill in the main part of the village. Dogs are prohibited from the southern beach area between the beach access point and Carreg-y-Ddafad between the 1st May and 30th September inclusive. Mwnt is a sheltered sandy cove, owned by the National Trust. This popular West Wales beach is off the beaten track but can be extremely busy in the height of summer. There are steep steps leading down to the beach, with parking available in a field opposite the path. Swimming conditions are considered safe at Mwnt but there is no lifeguard service. A well-trodden path circles and ascends Foel y Mwnt, the conical hill from which the beach takes its name. There are no dogs allowed on the beach between the 1st May and 30th September inclusive. Traeth Gwyn is a mile long crescent-shaped stretch of sand situated between New Quay's harbour beach and Llanina Point. It is made up of coarse sand and some shingle, backed by banks/cliffs of boulder clay. This rugged Cardigan Bay coastal path runs along the back of the beach at its eastern end, with steps up to the cliff top roughly at the centre of the beach. It is generally a safe beach for swimming and dogs are allowed at all times. Access is either from Llanina Point or, at low to mid-tide, from New Quay. There is a small (free) car parking area at Llanina woods (Grid Ref: SN405596) from where the coastal path leads to the point. A small stream emerges onto the beach here.